By definition core lawn aeration is completed using an aeration machine with hollow tines which mechanically removes plugs or “cores” of soil and thatch from the lawn. Core lawn aeration reduces soil compaction, creating a channel through which oxygen, water and nutrients can penetrate into the soil. Improves the natural breakdown of thatch. Core lawn aeration combined with over-seeding using a high quality blended seed mix selected for your lawn and a light time release fertilizer application will reflect overall improved visual results normally best reflected the following spring. For best results core lawn aeration, over-seeding and lawn restoration projects should only be completed in the fall. We do not do spring lawn restoration projects. 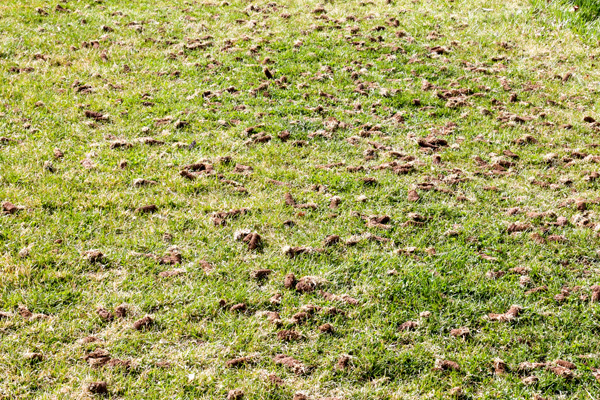 Click here to request an estimate for core lawn aeration. There are a variety of ways to complete core lawn aeration, over-seeding and fertilizer applications. Each step is linked to the other and each step must be completed properly. However, before and after treatment care of your lawn is vital to success. 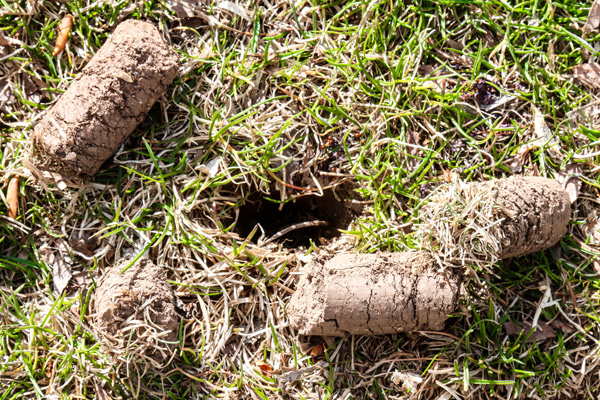 Here are the steps we use to complete a lawn restoration and core aeration project. On-site review of the soil and overall condition of your lawns health. We inspect for existing weed types, trees, shade patterns, slopes and ph of soil. In addition, we inspect to see where screened top soil may be needed to fill low spots. Several weeks before the core lawn aeration we begin liquid spot spraying of weeds. We try and eliminate as many weeds as possible first. We apply as many as three separate liquid treatments applied very specific to the weed types found on your property. We insure the length of the grass is cut cleanly around 3” before we begin the aeration process. On the day of the lawn aeration if needed we will bring in screened top soil mixed with a variety of compost and nutrients and fill in low spots on the property. We use our 36” core lawn aeration machine which hydraulically controls the plug depth of the holes. Each pass we make on your lawn we vary the plug depth depending on the hardness of the soil. We try to insure each soil plug pulled is at least 1"- 1 1/2” in length. Several passes are made in each direction over the same area. Once the aeration is completed we apply the highest quality grass seed blends usually mixed specifically for us. Throughout your property we use a variety of different seed mixes depending on the condition of the soil and access to the sun. We use a shade mix in shady areas, sun mix in full sun areas, an erosion control mix on slopes, etc. Usually no one seed blend is used on a single lawn. Lastly, we apply a light time release fertilizer to help provide the proper nutrients to your grass roots as they develop. Purchase inexpensive garden hoses, hose splitters and sprinklers and set them out in a pattern to cover your whole property after we complete our core lawn aeration process. Once we complete start watering. The first watering should soak the soil. All other watering’s should keep the soil moist. You should not allow the soil to dry out. Generally, water every three days or so. Keep watering for at least four weeks and longer if you can. The first lawn cut should occur no sooner than 3-4 weeks after the lawn aeration was completed. No other lawn application treatments are required until the following spring. The first lawn application the following spring should be a fertilizer only application. An herbicide application will kill the remaining un-germinated seed which was applied the previous fall. 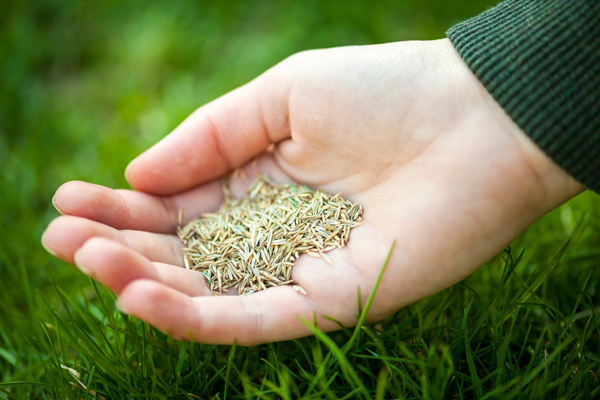 Your lawns health and condition are affected by a variety of natural and unnatural causes. Cutting your lawn below 3” in depth will normally expose the grass roots to the sun if your lawn is not thick enough. Lawn cutting using dull blades will affect the health of the grass. Improper application or lack of herbicides will affect the grass roots and surrounding weeds. Tree roots affect the surrounding soil and moisture content which will affect your lawns health. The list goes on and on. 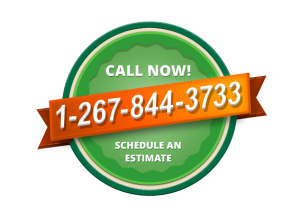 Lawn care and lawn restoration is an annual process. If you plan a lawn restoration project you should also plan to continue the process annually for a few years to restore your lawn to its best condition. The process and care takes time but you will see great results if properly completed and cared for.